At Wadia Dental Group, our dentistry team is dedicated to providing a strong foundation for great oral hygiene. Dr. Wadia and our professional staff are committed to ensuring our Escondido patients receive thorough care during their twice-yearly dental examinations and cleanings. A comprehensive dental exam and cleaning are recommended twice-yearly for children and adults. During your initial dental examination at Wadia Dental Group, our staff will take full mouth X-rays to ensure the health of your gums, teeth, and jaw. X-rays will not be required at every visit, and Dr. Wadia will discuss whether new X-rays will be required. During a twice-yearly check-up, patients receive a thorough examination of their teeth, gums, tongue, jaw, and neck. Dr. Wadia or one of our experienced dental hygienists will examine each tooth for cavities, plaque, or damage using a small pick instrument and mirror. 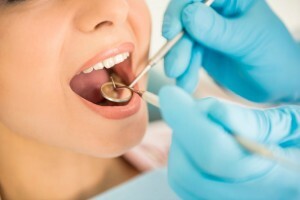 An examination of your gums will detect if any gum disease is present or needs treatment. Your head, neck and jaw are examined to diagnose any possible issues with glands or joints, such as TMJ disorder. If necessary, Dr. Wadia may recommend additional X-rays, an oral cancer screening, or a further periodontal inspection. Call us today at 760.747.4338 or make an appointment online for your examination and cleaning.